With the arrival of the football season, I know that it can be difficult to find delicious appetizers that will appeal to everyone! But trust me... there ARE healthier food options out there that actually taste good! I mean... yeah... 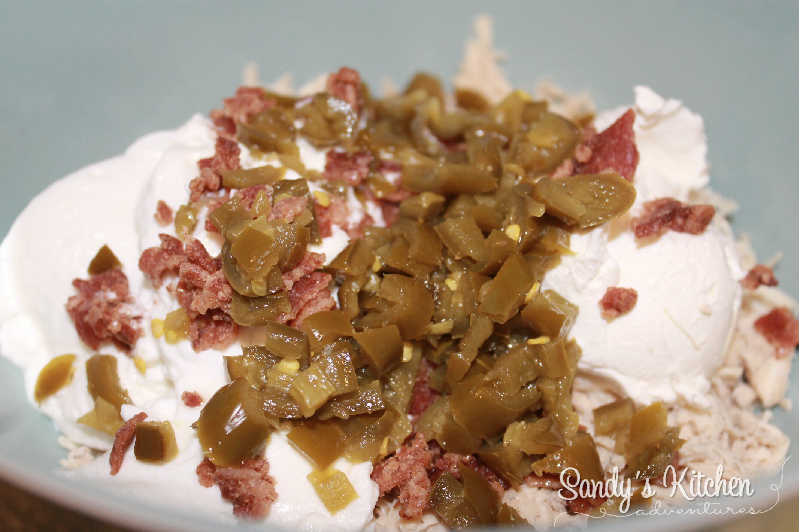 I still love buffalo hot wings, a yummy bowl of chili with all the fixings, burgers, sub sandwiches, chips, etc, but I have found some pretty tasty alternatives to my favorite party foods. This is one of them! I love spicy jalapenos mixed with ooey gooey cheese and the creamy goodness of Greek yogurt and cream cheese. 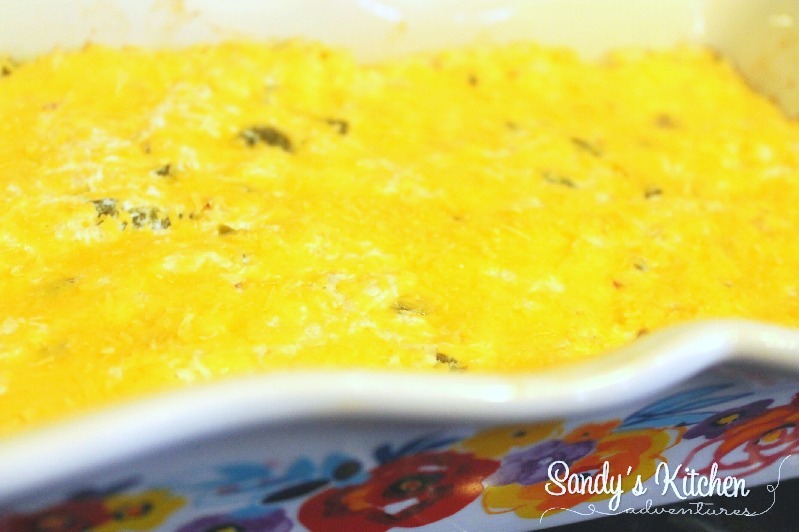 The added chicken packs this dip with extra protein and makes it more filling so you can have it as a complete meal with veggies! What makes this dish even better is that you can prep your chicken ahead of time. Prepping your chicken ahead of time makes this dish so easy to put together right before game time! No one wants to be stuck in the kitchen during the game! Come on! You can always buy a rotisseries chicken from the grocery store. Remove the skin and bones and shred it up. Season the defrosted chicken and then place them in the slow cooker. Pour 2 cups of chicken broth over the chicken. Cook 6 to 8 hours on LOW or 3 to 4 hours on High. Drain the chicken and shred the chicken with two forks. All done! Now you have enough chicken for a few meals! 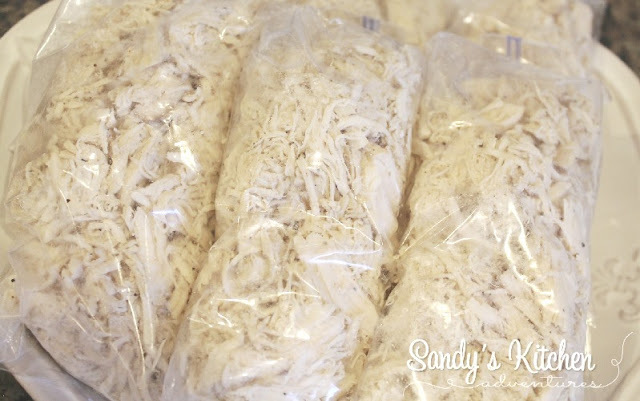 Weigh out 6 ounces of chicken and then place the portions into Ziploc baggies. Usually I put a few bags in the fridge and the rest in the freezer for later. These little baggies are great when I am craving chicken or need them for a recipe. 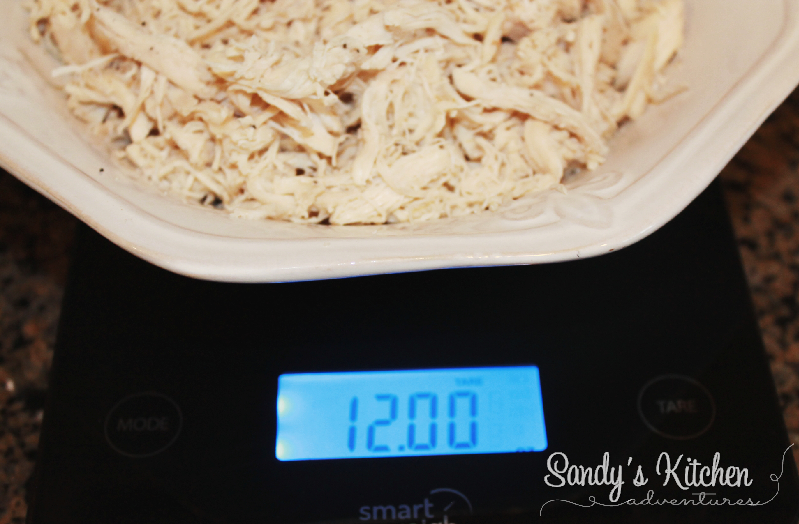 This recipe calls for 12 ounces of cooked chicken so I used my awesome scale to do all the measuring for me. Not to mention if you try to eyeball how much chicken you think you should have, it may not be accurate. You may be cheating yourself of some much needed protein or you may be eating too much. Now that your chicken is measured out, you can add all the other ingredients except half the cheese which is for the topping. Give it a good stir because you wouldn't want any pieces to feel left out! Pour the mixture into a baking dish. Spread it out evenly. Then top with the remaining cheese. Bake for about 20 minutes or until cheese is melted. The entire dish makes 4 servings. 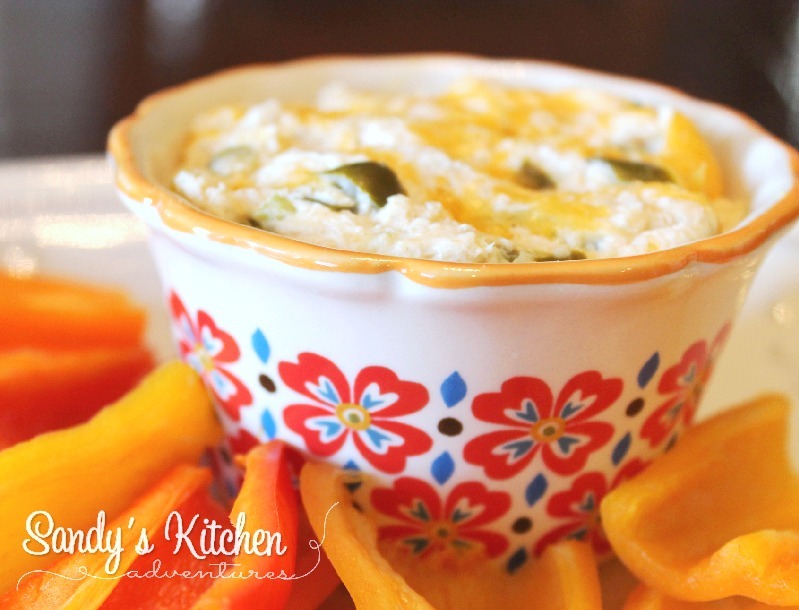 I took out my portion and put it in my own personal ramekin and served it with sweet mini peppers. Those darn veggies are addictive! 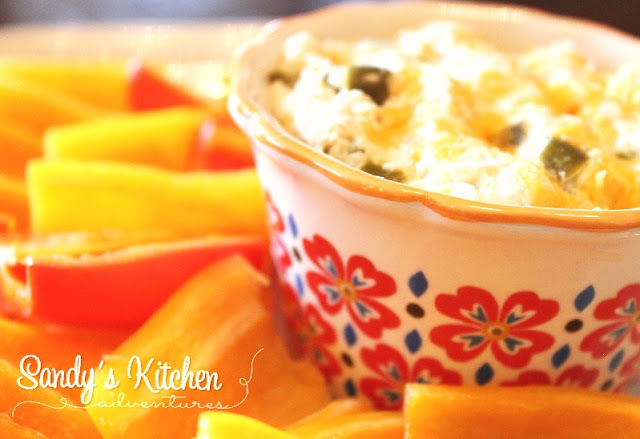 This dip would also make a delicious wrap because they have a thick consistency like chicken salad. Enjoy! 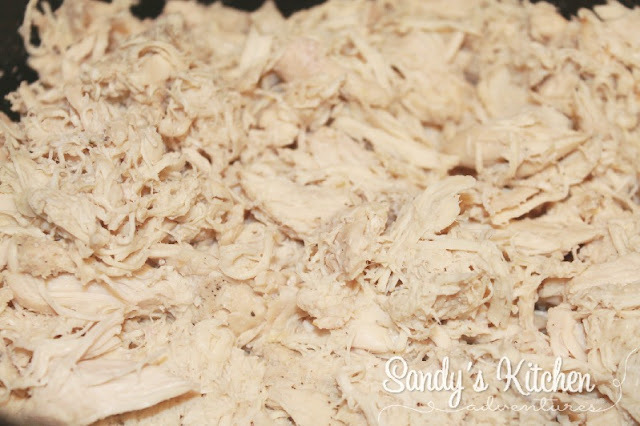 Combine shredded chicken, yogurt and cream cheese in a medium sized bowl. 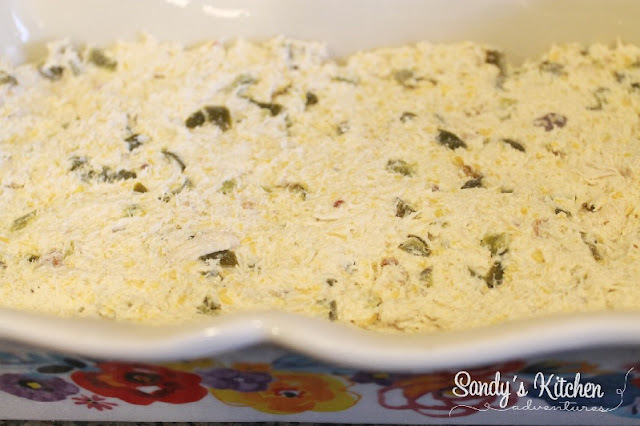 Add crumbled turkey bacon, diced jalapenos, garlic powder, onion powder, parmesan cheese and 1/2 cup cheddar cheese. Stir until combined. Pour mixture into a baking dish. Bake for 20 minutes or until cheese has melted.